Hey Mobsters! Sorry for the brief hiatus, but partying is hard work. 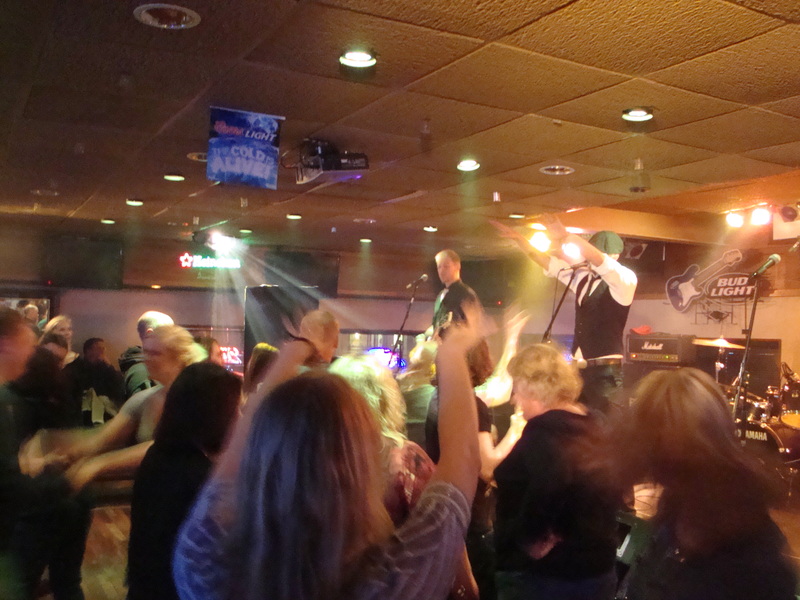 Check out the pics from the other weekend at one of our favorite spots–Babe’s Music Bar downtown Lakeville– then don’t miss the shenanigans TONIGHT at Pickle Park in Fridley! Red shoes just compliment the set list better. These shoes are just meant to give you vertigo. These shoes….. are for sale. Want ’em? What’s that? Oh. Why, yes, this is a live-action shot of Laura slapping Joe in the face. Yes Joe, the combination of red stage lights and your pedo-stache does make you look 76% more creepy. The awesome girls that helped us belt out Livin’!! The more of these pics I see, the happier I am that Movember is over. We’ve got a super fun 2012 planned, so don’t miss a moment–stay up on all the FM! news by clicking the ole’ “Like” button on FlashMob!’s Facebook Page, or follow FlashMob! on Twitter so Collin at least has someone to leak all those PG-13 pictures to.